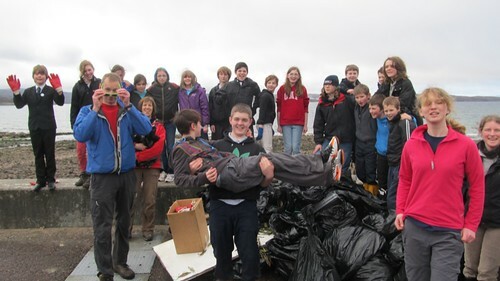 S1 Beach Clean – S1 pupils cleaned the beach between the Myrtle Bank and the Millcroft Hotels just before the end of term. Hopefully many of you noticed the difference. The pupils worked hard in the time they had but there is an incredible amount of debris. The staff and pupils involved were joined by some members of the community for the clean-up and the Council picked up the bags of collected rubbish left by the roadside. Thanks to Mr. Johnston for organizing this. Click on the photo below to see some more images of the beach clean. SQA Exams – S4 exams started next week. Facilities for study are provided within the school. S5 & S6 begin their exam leave on 4th May. We wish all the pupils success in their exams and hope that the efforts put in reap appropriate rewards. Duke of Edinburgh’s Award – Mairi Wyatt has been awarded her Bronze certificate and badge at assembly. Congratulations to Mairi AGAIN! Mairi was actually awarded her Bronze at Christmas. This was a mistake that slipped through the net. A group of S3 pupils are currently training for their Bronze Expeditions and they will be taking part in outdoor trips over the next few months. Highland Country Dancing – Last month Eilidh Owens (S3) took part in the Amateur Highland Dancing Competition for youngsters living in Highland. She received a Gold award after performing six dances. Eilidh then achieved Silver at Scottish National Amateur Level with a further 3 dances. Eilidh received a highly commended in both competitions. Well-done to Eilidh! Edinburgh Visit by the Assist with an Event Group – Euan La Page, Nicholas Stein and Sandy Garrioch (all S5 pupils) have been working with Mrs. Newman to organize a trip to Edinburgh. This Group is working towards achieving SQA units of award that will be added to their academic qualifications. 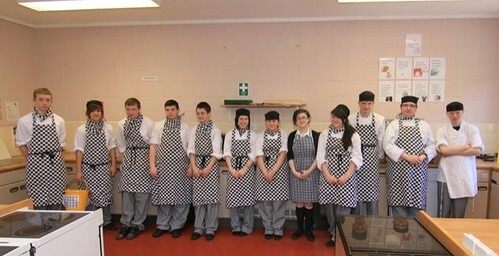 These additional units provide breadth to the CV of each pupil and provide valuable real life experience. The boys had to decide on where they would go and fund raise to pay for the trip. You may remember that previously they held a car wash at the school as part of their fund raising efforts. They also had a ‘guess the weight of the cake’ competition before Christmas. Here is Euan’s report with additional comments by Nick and Sandy from their Computing Studies ‘blogs’. Thanks to Mrs. Newman for putting in the work behind the scenes supporting the boys organize this trip and also to Mr. Milner for accompanying them to Edinburgh. S3 exams started last Tuesday on the first day back after the holidays. Good luck to the pupils sitting these exams. This term continues to be chock full of events but exams do take precedence for many of the older pupils. The S1 Nethybridge trip begins on the 14th May leaving S2 and S3 in school. These pupils will be getting an alternative timetable for the week and we plan to give them longer periods of time tackling particular tasks. For S3 this will include a full day of emergency first-aid training prior to taking part in Duke of Edinburgh’s Award expeditions. Rural Commission – Over 200 people turned out on the evening of the 19th March to meet the Commission for Rural Education. The meeting, their 11th, provided the largest public turnout by far and everyone involved was sure that the key factors affecting education in Gairloch were adequately addressed. We can only hope now that Commission has an effect that benefits communities like ours. Mr. Port would like to thank everyone who took the time to attend and participate. Minibus after School – Thanks to Allan Jones for driving the after-school minibus trip to Aultbea via Poolewe. This has allowed activities to be attended by many children. Parent Brian Wilson has also generously helped on several occasions. If anyone else is able to help please contact the school. Naidheachdan Gàidhlig / Gaelic News –Chuir Iain Friseal, a bhuineas do Gheàrrloch agus a bha ag obair aig Sgoil Eòlais na h-Alba, ùine seachad còmhla ri sgoilearan ann an clasaichean Gàidhlig Diardaoin an 23mh den Mhàrt. ‘S iomadh sgeulachd inntinneach ‘s èibhinn a bha aige dhuinn. Tha sinn airson taing a thoirt dha gun tàinig e a chèilidh oirnn. Ian Fraser, who belongs to Gairloch and worked at the Scottish School of Studies, spent some time with pupils in Gaelic classes on Thursday the 23rd of March. We enjoyed listening to many interesting and funny stories from bygone years. We would like to thank him for visiting us. Tha Rèidio Dà Locha a’ dol a chraoladh nan ceithir deasbadan anns an robh an sgioba againn thairis air na seachdainean a tha romhainn. Cluinnear cuideachd Ceitidh Alice agus Anna a’ còmhradh ri Alice NicCoinnich. Two Lochs’ Radio are going to broadcast the four debates that our team took part in during the next few weeks. Ceitidh Alice and Anna will also be heard in conversation with Alice MacKenzie. Comenius Italian Evening, Tuesday 20th March – Parents, pupils and members of the community were given a flavour of the Comenius trip to Breno in Lombardy through an exhibition of photos and blogs, the Flowerdale creative writing/history project presentation given to the students from the other partner schools in Italy, Germany, Greece and Latvia, a slideshow, personal presentations of their own experiences by the group, Leanne Mackay, Mags Matheson, Kieran Morrison and Ian Paul, an Italian aria “Che faro senza Euridice?” performed by Ruaidhri Wright, and, of course, choose-your-own-toppings pizzas. Thanks to the Parent Council, Andy Bowker, staff and pupils who helped make the evening a success. The final trip is to Athens from 22nd – 29th April involves Ciaran Alexander, Holly Morrison and Innis Taylor, next term. Information and photos about all the trips on the Comenius website. French Trip – Preparations are well underway for this trip in June, when most of our S2 and S3 pupils will visit Normandy and Paris. Once again, we will be staying in the Château du Molay, near Bayeux. We have many exciting visits planned, including a trip to the Peace Memorial in Caen and a day at Parc Astérix, outside Paris. Information about the parents’ evening, planned for Wednesday 2nd May at 7pm in the school hall, will go out after the Easter break. Cashless Catering The new system for paying for school meals has been successfully implemented. We have been informed that the school meal prices will increase from 1st April 2012. The new 2 course charges are: Primary £1.80, Secondary £2.00 & Adult staff £3.25. 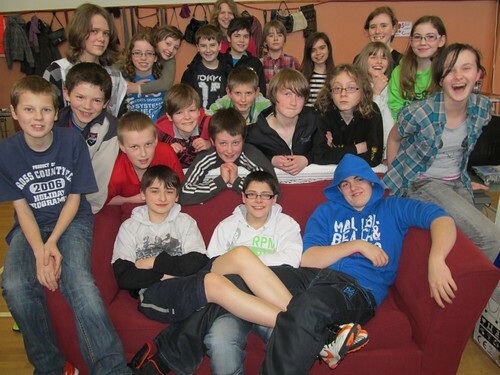 S1 Bring and Buy – Over £2100 was raised by S1 at their Bring and Buy sale recently. Thanks to everyone who came along and enjoyed the atmosphere. The raffle and the refreshments along with a variety of interesting stalls made for an entertaining few hours. S1 would like to thank all the parents and teachers who helped them on the day as well as everyone who donated to this event. Click on the photo for more images of the day. Sport Relief 2012 – We are still gathering the sponsor money however we believe that our Sport Relief mile around the school is likely to raise over £1000. Well done to everyone who contributed to this heart-warming event. Click on the image below to see more of the day. 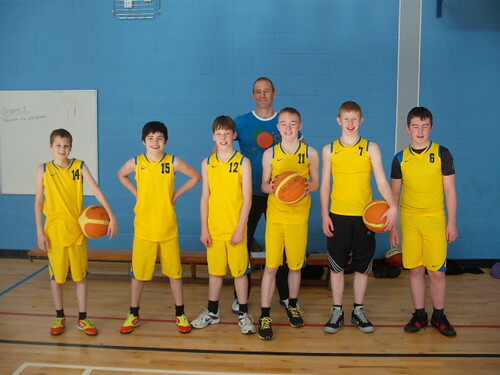 Basketball – Two boys’ teams played Inverness Royal Academy last Wednesday. Both the U14 team and the Gairloch All-Stars were on good form and won very convincingly. We’ve played lots of games this session and have won most of them – this is down to the boys’ commitment to regular training. We look forward to more success next season. Click on the photo to see more photos. Geobus – The majority of pupils were involved in Geology workshops recently when St Andrews University sent their Geobus. Throughout the day pupils took part in practical experiments outlining Volcanic Activity, Fossils, Fluvial Processes and Geological Time. 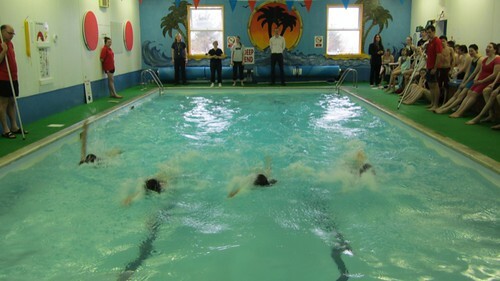 Swimming Gala – On Thursday 29th March, the annual inter-house Swimming Gala took place. Approximately 70 pupils took part, with Maree providing the majority of participants. As always, the relay races at the end filled the atmosphere with a sense of team spirit. These races are worth double points, so competition runs high. For the senior girls’ race, Maree was the only house who could provide a full team, so they won maximum points by forfeit of the other houses. However, to give them a run for their money and to make them swim for those points, Kerry and Tollaidh joined forces. Maree still won the race, although Kerry and Tollaidh combined proved to be a strong team.. The final result: Maree came first, with a whopping total of 288 points. Kerry and Tollaidh came joint-second, with 168 points. Well done to all the participants, and to the staff involved in the organisation and running of the event. We hope to see more pupils willing to take part next year! – Report by Carianne Johnston S6. 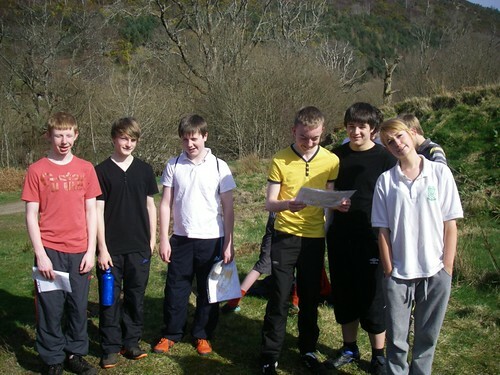 S2 Inter-House Orienteering – Well done to the S4 Sport and Recreation class for organising and running the inter-house orienteering event on Monday. The S3 class also assisted by acting as marshals on the day. All S2 pupils participated by running or walking around Flowerdale. Calum Nelson and Mark Warren completed the course in a very fast time, 6 minutes ahead of Cameron and Aaron in 2nd place and Natasha and Charlotte in 3rd. Kerry took 1st place in the house competition. Maree was 2nd and Tollaidh 3rd. Photos of the event are on the school website. Click on the photo below to see them. Study Club – This took place for S4, S5 and S6 pupils on Monday 2nd April to Wednesday 4th April inclusive. Thanks to all staff who were involved – particularly Miss Hunter who managed the arrangements. Strath Stores provided soup and sandwiches. Edinburgh Trip – A small group of senior pupils provided a report of their trip to Edinburgh recently. They planned and organised the trip as part of their course in S5. Due to lack of space the report will appear in the next edition. Important Dates – Available on the website by clicking here. Staff and pupils return to school on Tuesday 17th April to begin the new term.